I was eager to see if it would deliver on its advertising payoff line: ‘Expect Visible Results.’ “Understanding the aspects of ageing skin will enable one to take better care of it,” says Charlene Coussens, DR. GOBAC‘s Head of Training. While eye make-up remover is applied and followed up by DR. GOBAC Wash, she tells me that Dr. Robert Gobac is a medical doctor with a background in acupuncture, Traditional Chinese Medicine and Naturopathy. His belief is that it is possible to stimulate self-repair mechanisms of the skin just as in any other organ in the human body. Drawing on extensive experience and research, he developed a non-invasive, non-aggressive but effective skincare treatments that facilitate this healing process. Charlene says that salon owners who are on the lookout for a professional brand are bowled over with results after experiencing the treatment first-hand. They realise the benefits for their clients and indeed, the owner of Pinnacurl Pamper, Chantele is a convert who enthusiastically told me of the benefits to her skin. Secondly, the 10-hexapeptide increases skin cell proliferation and adhesion, and induces a significant increase in the dermis density.” explains Charlene. An Enzymatic Exfoliant Mask is applied and while that worked, I experienced a tingling, almost ice sting sensation, that soon calmed down. “This form of exfoliation is a mild but effective alternative to alpha hydroxy acids. Dead skin cells are naturally eliminated ensuring a smooth skin surface and gently stimulates cell renewal.” Says Charlene After 10 minutes, the mask is not removed but incorporated into the massage step. DR. GOBAC Massage Cream has high spreadibilty, it is a non-irritant, non-greasy, light moisturising massage cream. After enquiring if I have any metal implants which are contra-indicated for use with a galvanic device, we are ready for the next stage. DR. GOBAC Treatment Gel is applied prior to the galvanic treatment which assists penetration of products deeper into the skin. I felt just a light buzzing. The gel has active ingredients which relax the facial expression muscles, help plump up the skin, nourish and feed the cells leaving the skin with a more hydrated, firmer feel. Next up is the Vitamin A Serum which is specifically formulated to remobilise the skin’s own healing mechanism and is ideal for use after the age of 35. A light spritz of DR. GOBAC Balancing Mist is then administered to facilitate secondary absorption. 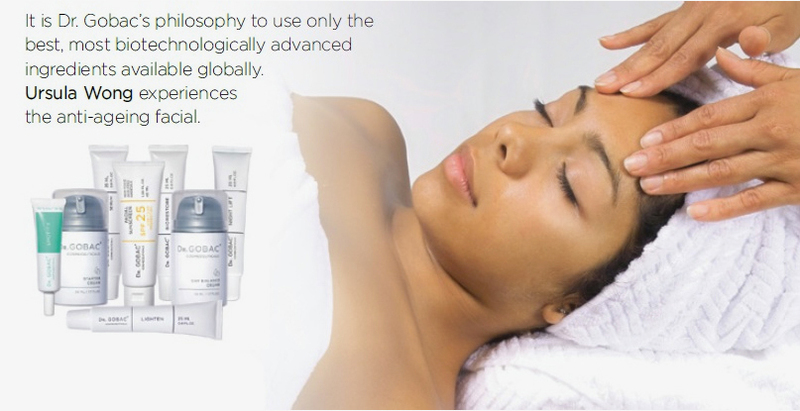 To further aid in prolonging the effects of the anti-ageing facial, DR. GOBAC Biorestore is applied. The slow releasing cocktail of antioxidants assists in increasing hypodermic tissue thickness Because I had a lot of spots around the chin, caused by fluctuating hormones, Charlene applied Spot Treatment Gel before the final step. The application of DR. GOBAC Day Balance Cream completes the treatment. “This complex formulation is carefully balanced to rehabilitate the skin deep down. Importantly, the product contains phyto-hormones found in the various herbal extracts. These stimulate and revive skin cells without causing the adverse effects possible with synthetic hormones.” says Charlene. Was I rewarded with visible results?